This post was originally published on the Wovember blog on the 6th Wovember, 2011. It was written by Kate Davies and we are thrilled to republish it here as one of our “from the Wovember archives” pieces. We all probably know that knitting socks for “our boys” became a part of the war effort during World War II, but perhaps less familiar is this piece of sheepy propaganda from the First World War. In October 1918 – a few weeks before the conclusion of the war – the US board of agriculture issued 5000 copies of this poster to encourage the children of rural America to join the 4-H club movement, ostensibly in support of fighting troops. The poster clearly had a dramatic effect — by the following year, it was reported that 4-H club membership had doubled. But was the intention to ensure soldiers were wool-clad, or to support the development of a popular government program? A hearing before the House of Representatives Agriculture Committee in 1920 suggests that it was quite clearly the latter. 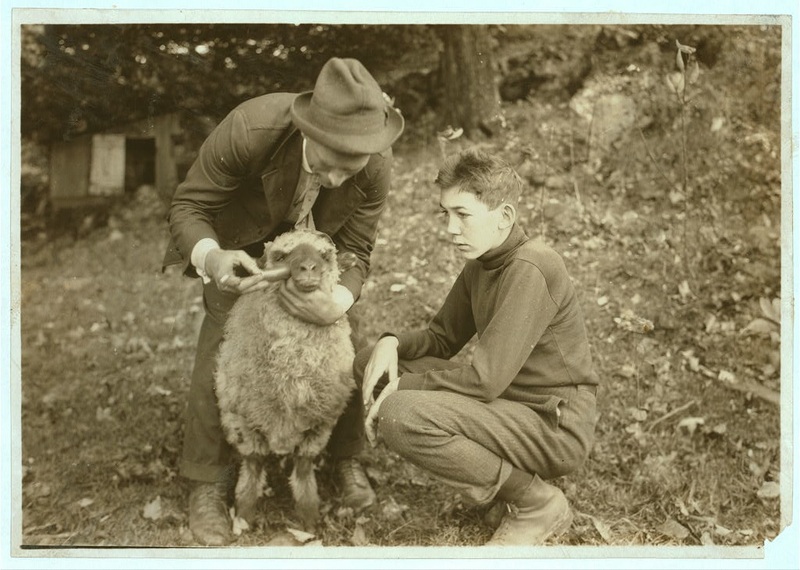 At the committee, it was reported that the sheep club poster had become “quite an asset” in encouraging 4-H membership “particularly as it was a very attractive poster, and one that would appeal to boys.” The poster had been a massive success, the report concluded: “when it is realized that each club member is required to secure four or more bred ewes, it will give some idea as to the increase of sheep as a result of this work.” That same year, Lewis Hines photographed several boys who had recently joined 4-H clubs, including the young Forest Kellison, from West Virginia, who is depicted below, being taught how to treat his sheep for parasites. Perhaps he had been “recruited” to the woolly cause by the poster.